All members – including subject officers, witnesses and internal complainants – are encouraged to seek the confidential assistance of People Support Services if required. The services of People Support are available to all members and their families. 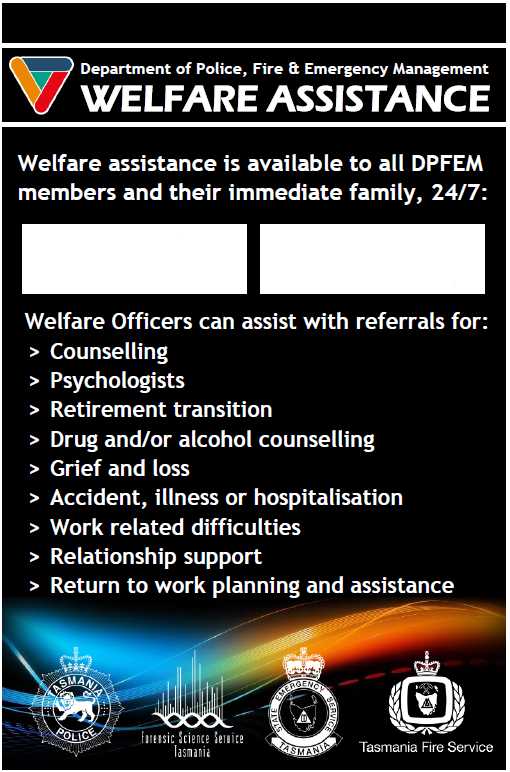 Welfare officers are available 24 hours a day, seven days a week. The psychologist or a counsellor is also available during business hours. Managers can also assist with facilitating workplace support. return to work planning and assistance. Under Part 13 of the TPM members must comply with the following Orders. A member who is advised by any person that they wish to make a complaint against a police officer, or Tasmania Police, is required to obtain details (person reporting, circumstances, etc.) and must register the matter on IAPro or BlueTeam as a Complaint 1, Complaint 2 or Complaint 3 (whichever is appropriate to the circumstances). A statement of complaint must be obtained for all Complaint 2 and Complaint 3 matters. A statement of complaint is not required for Complaint 1 matters. Certain members are exempted from this Order in particular circumstances. Those circumstances are detailed in Abacus 5.3 Receiving Complaints. must immediately inform a senior officer and register the matter on BlueTeam as an Information Only report. The Information Only report may be recategorised as appropriate. A member appearing in any court as a defendant or accused person is not to wear any item of police uniform. An inter-department committee advises the government on legal actions against public officers, including members, for acts or omissions arising in the course of the performance of their duties. If a writ or summons is served on a member alleging an act or omission arising in the course of the performance of the member’s duties, that member is to, immediately submit a full report, in writing, of the circumstances through official channels to the Assistant Commissioner, Specialist Support. The report is to include advice on what action, if any the member is considering taking to defend the action. The member should seek early advice in relation to representation and the legal expenses attached to that representation. Members should also be aware of the Legal Assistance provisions. When members feel confident to report conduct within the organisation it indicates a robust and accountable system. Members should feel empowered to report any member in accordance with our values and obligations, including those in Part 13 of the TPM. Any victimisation of police complainants will not be tolerated. Such behaviour constitutes a breach of section 42(12) of the Police Service Act 2003. Any member becoming aware of such conduct must either register it on BlueTeam as a new matter, or report it to a senior officer. Failure to comply with this will undermine the entire system. In this instance, the reporting member can choose to make the report anonymously. This can be done in a variety of ways – irrespective, the member will need to keep a record of when, where and how the matter was reported. This is essential should the member be required to demonstrate that they have complied with the TPM obligation to report a member breaching the Code of Conduct. Alternatively members may make a public interest disclosure or make a report to another agency – see Alternative Complaint Agencies. If members make a complaint directly to an external agency they should enquire as to how it will be handled, as it may be referred back to Tasmania Police for investigation and resolution. Subject officers are entitled to rights that are available regardless of whether the matter involves allegations of an offence, serious offence or crime, or a breach of the Code of Conduct. Subject officers will be treated in accordance with the Values of Tasmania Police. If a subject officer believes that an inquirer / investigator or authoriser has a conflict of interest that should preclude them from involvement in the matter, they must provide written advice to their manager detailing the conflict. The inquirer / investigator or authoriser will then consider the matter and, if it is believed that an insurmountable conflict exists, refer the matter to the relevant Commander or the Deputy Commissioner for determination. Recent High Court of Australia cases have questioned the legal authority to remove the privilege of self-incrimination, the right to silence and the use of evidence of compulsion. Against this background a set of interview protocols has been established and is set out below. If at any point in an investigation it is decided that the matter is to be investigated purely as a Code of Conduct matter, the member is to be informed of this in writing or verbally in the audio interview (meaning, although a prima facie case for prosecution might exist, a decision has been made to deal with it solely as a Code of Conduct matter). Due credit is recognition of a subject officer’s own actions towards resolving a matter (such as making an apology or a voluntary disclosure). Such recognition may be shown through leniency in the final outcome. Subject officers who are asked to submit a written report are instructed to do so in writing by a senior officer, a member of Professional Standards or a member delegated by the Commissioner. They are given 15 calendar days (or a period as agreed) to respond in writing. The response is to be provided directly to the inquirer / investigator (without following the usual chain of command) although the subject officer is entitled to provide a copy to their supervisor or manager if they choose. The written report is not to be placed on HP Records Manager. The written report can be sent via e-mail. Direction to provide a written report will only apply when there is no criminal allegation. When providing a written report members should submit a subject report. The above rights are available to subject officers at all times during the process and are to be stated in the written direction to provide the report. If subject officers wish to seek an extension of time beyond 15 calendar days they are to submit a written request (email will suffice) to the inquirer / investigator. Subject officers should be aware that additional information may be required of them. This might result in a request for an additional written report or participation in an interview. The Police Association of Tasmania operates a legal assistance hotline. be interviewed at a reasonable hour (unless unique circumstances apply and preclude this). The above rights are available to subject officers at all times. Items 1 to 8 must be read out to subject officers at the commencement of the interview. If subject officers wish to exercise any of these rights they should advise the interviewing officers. The interviewing officers will suspend the interview to enable the subject officer to have an opportunity to seek or be provided with those rights. The independent person mentioned in item 1 may be present in the room throughout the interview but is not allowed to respond to any questions put to the interviewee. If an independent person wishes to speak they should ask for the interview to be suspended so that they may speak to the subject officer. An independent person is to be aware that their presence is by invitation and the invitation can be withdrawn at any time. If an independent person’s invitation to be present is withdrawn, the subject officer is to be advised that they can have another independent person present. An independent person should be aware that they may be called as a witness to any proceedings. Members of the Police Association of Tasmania may be entitled to apply to the Legal Assistance Scheme for financial assistance for legal advice and / or legal representation in cases where the matter giving rise to the advice or representation arose out of the member’s duties as a police officer or where action is taken or proposed under the Police Service Act 2003. Factors taken in to consideration by the Police Association of Tasmania when considering applications to the Legal Assistance Scheme include whether or not the member’s behaviour is consistent with ethical policing practices and / or done in good faith; and / or the assistance is in the interests of the general membership. A Legal Committee made up of Executive Members considers all applications. If an application is unsuccessful, an appeal can be made to the full Executive. Members must contact the Police Association of Tasmania prior to incurring legal expenses if it is intended to submit a claim for those legal expenses. Legal assistance can be provided to members who receive certain types of ‘coercive’ notices from the Integrity Commission. The legal assistance may be provided by the Principal Legal Officer. If the Principal Legal Officer is unable to assist, financial assistance up to a value of $3,000 is available on request to the Commissioner. Members are advised to inform the Commissioner of their intention to seek financial assistance prior to incurring legal expenses if they intended to submit a claim for those legal expenses. While ‘coercive’ notices specify that members cannot divulge their existence to anyone, legal advice is that members who intend to seek legal assistance have a ‘reasonable excuse’ to inform the Commissioner. If a member is named as a respondent in an Equal Opportunity Tasmania matter, Tasmania Police is also named as a respondent. The Principal Legal Officer represents Tasmania Police and, except where there is a conflict of interest, the member. If the Principal Legal Officer is not able to represent the member, the member should consider requesting legal assistance from the Commissioner. Legal assistance, up to a value of $3,000, may be available. Members are advised to inform the Commissioner of their intention to seek financial assistance prior to incurring legal expenses if they intended to submit a claim for those legal expenses. (d) conduct the investigation in any manner the Commissioner considers appropriate. This section applies to what is commonly referred to as directed interviews. Subject officers should be aware that if they elect not to answer questions in the directed interview a determination will be made based on the evidence that is available. That determination will be made on the balance of probabilities. Inquirers / investigators conducting interviews must give an undertaking to subject officers that they will not provide any directed interview, or any material obtained as a consequence of a directed interview of a subject officer, to the DPP or any other prosecuting authority, in matters that relate to the prosecution of the subject officer. The only exception would be if the subject officer provides written consent for that interview to be tendered in evidence This requirement is to form part of the interview preamble and is contained within the template. The process applying to matters that are prosecuted is at Court Proceedings. If a member of the public is being prosecuted and the circumstances of the charge involve a complaint against police, any statements obtained during the inquiry / investigation of the complaint are disclosable to the defence. The Principal Legal Officer has advised that this includes interviews / statements in which subject officers have been directed to answer questions. Those interviews continue to not be available to any prosecution of the subject officer. Subject officers are entitled to access material in relation to any inquiry / investigation. The process is described under Right to Information. In accordance with the principles of procedural fairness subject officers are entitled to make a written submission in response to a ‘notice’ they receive from the Commissioner (or their delegate) in relation to intended action under section 43(3) of the Police Service Act 2003. Under Abacus the timeframe is 15 days or other time period as agreed. Refer to Provisional Report for more details. Under Abacus the ‘notice’ to the subject officer is in the format of the Provisional Report, however from time to time the notice may be in another format e.g. notice to ‘show cause’ relating to termination of appointment. The subject officer’s submission must be made within the period specified in the ‘notice’ and it is to be provided directly to the authoriser (e-mail would suffice). Under Abacus subject officers are invited to make a submission in reference to action under section 43(3) (a),(b),(e),(f) and (g) relating to counselling, reprimand, reassignment, transfer and probation. any other matter the subject officer considers is relevant and pertinent to the making of a final decision. If a subject officer seeks access to any documentation they should proceed as outlined in Right to Information. Any Determination Notices issued will be kept in members’ HP Records Manager dossiers. Staff within People and Culture have access to HP Records Manager dossiers and are entitled to consider any Determination Notice as part of the member’s conduct history when assessing their application for a course and their suitability for the course. Any Determination Notices issued will be contained in members’ HP Records Manager dossiers. Staff within People and Culture have access to HP Records Manager dossiers and are entitled to consider any Determination Notice as part of the member’s conduct history when assessing their application for transfer and their suitability for the position. People and Culture are able to seek advice from Professional Standards on current Abacus matters only where the transfer relates to a position in which there is considered to be organisational risk. In determining whether to promote or recommend the promotion of a police officer, the Commissioner may take into account the conduct of the police officer. Any Determination Notices issued will be contained in members’ HP Records Manager HR dossier. Staff within People and Culture have access to HP Records Manager dossiers and are entitled to consider any Determination Notice as part of the member’s conduct history when assessing their application for promotion and their suitability for the rank. People and Culture are able to seek advice from Professional Standards on current Abacus matters in relation to all applicants for promotion. Whilst People and Culture can be advised of current Abacus matters, they cannot be given significant weight in the promotion process as the person may be not have breached the Code of Conduct or committed an offence, serious offence or crime. The Commissioner’s Medal may be awarded to members who have completed a period of 10 years continuous, diligent and ethical service and is earned through honest hard work, dedication to duty and professionalism. The National Police Service Medal may be awarded to members who have served a minimum 15 years with demonstrated commitment to ethical and diligent service. If a subject officer receives a Determination Notice with resulting section 43(3) Action of reprimand or higher, the Determination Notice must include a limitation on wearing or being awarded the Commissioner’s Medal, clasp or National Police Service Medal for a finite period of time (such as 12 months). The period of time will be stated on the Determination Notice. The subject officer must have been advised of the proposed period of ineligibility in the Provisional Report. At the conclusion of that period the subject officer’s eligibility will be reinstated. A Commander is able to impose a limitation on the subject officer wearing or being awarded the Commissioner’s Medal or National Police Service Medal for a period up to and including 12 months. An Assistant Commissioner or the Deputy Commissioner can impose a limitation on the subject officer wearing or being awarded the Commissioner’s Medal or National Police Service Medal for a period up to and including 5 years. If a subject officer has not yet been awarded a medal, or is yet to be eligible, the authoriser is to give consideration to whether the eligibility is to be deferred when the subject officer becomes eligible to receive the medal. If a limitation of time is to be applied, the subject officer must be advised of this in the Provisional Report and in the Determination notice. If a member has been found to have committed a serious offence or crime they may be deemed permanently ineligible to receive or wear the Commissioner’s Medal, clasp or National Police Service Medal. Any decision of this nature is to be made by the Commissioner or Deputy Commissioner. Officer X has served for 15 years and is the recipient of the Commissioner’s Medal for Diligent and Ethical Service. She has been reprimanded by the Deputy Commissioner and fined for an honesty and integrity breach of the Code of Conduct. The Deputy Commissioner, given the seriousness of the section 43(3) action taken (reprimand and fine), must impose a period of ineligibility to wear the Commissioner’s Medal. The Deputy Commissioner imposes a period of 12 months. Officer Y has served for five years and is due to be considered for the Commissioner’s Medal in five years. The circumstances of the matter are exactly the same as Officer X. The Deputy Commissioner must consider whether to defer Officer Y’s eligibility to be awarded the Commissioner’s Medal. The Deputy Commissioner defers Officer Y’s eligibility to be awarded the Commissioner’s Medal for a period of 12 months from the date they would have been eligible (e.g. their 10th anniversary). As a witness officer is not being investigated for an offence, serious offence or crime, they do not have the protection against self-incrimination (right to silence) that applies to subject officers. (b) conduct the investigation in any manner the Commissioner considers appropriate. Witness officers should be aware that evidence they provide – whether under direction or otherwise – will be used as part of the inquiry/investigation process. It may also be provided to another party who is lawfully entitled to access it (e.g. the DPP or defence counsel). During a directed interview, if a witness officer makes any admission in relation to their role as a principal offender in an offence, serious offence or crime, that interview is to cease and a caution interview commence. Any material relevant to them obtained as a consequence of that directed interview, will not be provided to the DPP or any other prosecuting authority, in matters involving the prosecution of the witness officer. The only exception would be if the witness officer (who would now be considered to be a subject officer) provides written consent for that interview to be tendered in evidence. A witness officer who makes any admissions, etc. (e.g. to a breach of the Code of Conduct, or the commission of an offence, serious offence or crime) is entitled, from the time of the disclosure to the same rights as a subject officer. If a member of the public is being prosecuted and the circumstances of the charge involve a complaint against police, any statements obtained during the inquiry / investigation of the complaint are disclosable to the defence. The Principal Legal Officer has advised that this includes interviews / statements in which witness officers have been directed to answer questions. Those interviews continue to be unavailable in any prosecution of the witness officer. Witness officers who are asked to submit a written report are required to do so within 15 calendar days (or a period as agreed). The response is to be provided directly to the inquirer / investigator (without following the usual chain of command) although the witness officer is entitled to provide a copy to their supervisor or manager should they wish to do so. The written report is not to be placed on HP Records Manager. The written report can be sent via e-mail. The above rights are available to witness officers at all times during the process. If a witness officer wishes to seek an extension of time beyond 15 calendar days they are to submit a written request to the inquirer / investigator. Witness officers should be aware that additional information may be required of them. This might result in a request for an additional written report or participation in an interview. The above rights are available to witness officers at all times. Items 1 to 5 must be read out to witness officers at the commencement of the interview. The interviewing officers will suspend the interview to enable the witness officer to have an opportunity to seek or be provided with those rights. The independent person mentioned in item 1 may be present in the room throughout the interview but is not allowed to respond to any questions put to the interviewee. If an independent person wishes to speak they should ask for the interview to be suspended so that they may speak to the witness officer. An independent person is to be aware that their presence is by invitation and the invitation can be withdrawn at any time. If an independent person’s invitation to be present is withdrawn, the witness officer is to be advised that they can have another independent person present. An independent person should be aware that they may be called as a witness to any proceedings. Tasmania Police will not inquire into or investigate a complaint that is being dealt with by another agency unless approved by the Deputy Commissioner. If Tasmania Police has already inquired into or investigated the matter, any subject officer directed interview will not be provided to an external agency that has a prosecutorial role if the prosecution is of that subject officer. Subject officer directed interviews will only be provided to an external agency in accordance with legislation. Equal Opportunity Tasmania is responsible for investigation of complaints about conduct prohibited by the Tasmanian Anti-Discrimination Act 1998. The complaint is assessed against the Act and the Anti-Discrimination Commissioner determines whether the complaint can be dealt with under the Act or is outside the scope of the Act. If outside the scope of the Act, the complaint will be rejected. If within the scope of the Act, the complaint is investigated and pending the outcome of the investigation, the complaint will either be dismissed, resolved through conciliation or referred to the Anti-Discrimination Tribunal (ADT) for an inquiry. A party may be permitted by the ADT to be represented by a lawyer or other authorised person or accompanied by another person: a written or verbal application for such permission must be made to the ADT at the earliest opportunity. Members may be eligible for legal assistance in relation to Equal Opportunity Tasmania matters. If the matter is referred to the Tribunal, a Directions Conference will be held (in private). A Tribunal Member will make directions to the parties in relation to the preparation of information for the Hearing including lists of documents they want to present and witnesses they intend to call. The Tribunal may, by notice, require any person (not just a party) to attend a directions conference and require that person to provide and produce specific information and documents to the conference. Many parties are not legally represented at Directions Conferences. Proceedings are relatively informal and have been designed to be straightforward. A Referral Report will be prepared by the Anti-Discrimination Commissioner, which will identify documents gathered during the investigation and witnesses the Commissioner considers should be called at the inquiry. However, the parties are not bound by this Report, and are free to decide which witnesses to call and which documents to present, including any not listed in the Report. Any documents listed in the Report are available for the parties to inspect and copy, unless an objection has been made by a party on the grounds of confidentiality, in which case the Tribunal will determine if the document should be made available. The Tribunal may refer a complaint to conciliation, facilitated by an experienced conciliator appointed by the Tribunal, at any stage. The parties and their legal advisor or advocate are required to attend. Conciliation is held in private. If conciliation is not successful then the matter is resolved by inquiry. Nothing said during conciliation will be disclosed if the matter proceeds to inquiry. The inquiry is held in public unless the Tribunal otherwise directs. The ADT may order any oral or documentary evidence not be published or that the identity of any person not be disclosed. Any person seeking such an order may request this at any stage verbally or in writing. At the inquiry Hearing, each party is responsible for the presentation of their case. The party who brings the complaint has the burden of proving the complaint. However, the conduct of an inquiry is inquisitorial and the ADT is not restricted to the evidence or material relied upon by the parties. Although obliged to comply with rules of natural justice, the ADT is not bound by the laws of evidence and will ensure that all material that may assist its consideration of a matter is provided to it. If the Tribunal finds that the complaint is substantiated, it may order the respondent: not to repeat or continue the prohibited conduct; to redress any loss or injury suffered by the complainant as a result of the prohibited conduct; to re-employ the complainant; to pay, within a specified period, an amount the Tribunal thinks is appropriate compensation; to pay a fine not exceeding 20 penalty units; to vary or declare void any contract or agreement. It may also order that it is inappropriate for further action to be taken, or make any other order it thinks is appropriate. Determinations of the ADT may be appealed to the Supreme Court. Integrity Commission investigations can be very wide-ranging and gathering evidence in a complex investigation can take a significant period of time. The decision to start an investigation does not mean that there has been any wrongdoing. The Integrity Commission’s role is to investigate and establish the facts. The Integrity Commission does not make findings of misconduct. The Integrity Commission’s powers include entry, search and seizure, use of surveillance devices; and directions to attend, answer questions and produce information. The Integrity Commission does not generally exercise investigative powers such as telecommunications interception, integrity testing or assumed identities. Often witnesses who are not suspected of any wrongdoing are required to give evidence for no other reason than to assist an inquiry. In that instance, members will not necessarily be told the detail of the matter prior to giving evidence. Evidence is generally given in private, although the Integrity Commission does have the ability to convene public Integrity Tribunals. A person required or directed to give evidence or answer questions as part of an investigation may choose to be represented by a legal practitioner or other independent person. A brochure to assist witnesses understand the process involved in giving evidence is available here. The Integrity Commission may serve notices upon members to compulsorily give evidence or produce documents. If this happens a member will usually first be contacted by the investigator by phone. The investigator will arrange to meet with the member privately to serve the notice and to explain the process to be followed. A notice is usually subject to confidentiality provisions (which will be explained in the notice) and members will not be able to discuss the notice or its contents with anyone unless they have a ‘reasonable excuse’ to do so (refer section 98 of the Integrity Commission Act 2009). Members should take care to ensure they do not do or say anything that might disclose the existence of the notice to any person. However, members may disclose the existence of the notice if it is necessary for obtaining legal advice or in order to ensure compliance with the notice. For example, members may need to brief a colleague in order to retrieve or gain access to a relevant document; or request permission from a supervisor to leave the workplace to give evidence. If it is necessary to inform another person, section 98(2)(b) of the Integrity Commission Act 2009 stipulates that members should also inform that person that the notice is a confidential document and that it is an offence for them to disclose the existence of the notice to another person unless there is a reasonable excuse. An Integrity Commission investigator may contact a member and explain the level of contact the member is likely to have with the Integrity Commission before and after the completion of the investigation. If a member has been part of an investigation and received a notice containing confidentiality provisions, the member will be notified when the matter has been finalised and that the confidentiality provisions attached to the notice have been removed. If you have any doubt about whether or not it is reasonable in a particular case to disclose the existence of the Notice, you should seek to clarify the matter with the nominated contact officer. A Commission investigator must comply with the rules of procedural fairness. In practice this includes providing an opportunity to a person, about whom an adverse finding or comment might be made, to provide comments or submissions. The investigator takes these into account before finalising the investigation report for the Commission CEO. Evidence collected by the Integrity Commission as part of an investigation is not subject to the Right to Information Act 2009. Generally the Integrity Commission does not report publicly on its investigations; however, it can and does from time to time including when it is deemed to be in the public interest. Each investigation is different and the content of such a report is decided on a case-by-case basis. Members may be eligible for legal assistance in relation to Integrity Commission matters. The Ombudsman Tasmania is an independent statutory officer pursuant to the Ombudsman Act 1978. The role of the Ombudsman Tasmania is to investigate the administrative actions of public authorities to ensure that their actions are lawful, reasonable and fair. The Ombudsman Tasmania works in an independent, impartial and objective way to resolve complaints and to address systemic problems in order to improve the quality and standard of Tasmanian public administration. Ombudsman Tasmania will not accept complaints where a member has an avenue of review through a court or the Police Review Board and generally requires that members attempt to resolve a complaint with the entity complained about in the first instance. Online complaint forms are available at www.ombudsman.tas.gov.au. After a complaint is received it is assigned to an investigation officer who will assess the matter to determine whether or not it is within jurisdiction and if it meets the required thresholds imposed by the Ombudsman Act 1978, and in most cases preliminary inquiries are made with the relevant public authority (i.e. Tasmania Police). Over 90% of complaints are resolved through the preliminary inquiry process but occasionally a formal investigation is conducted if a complaint appears to disclose serious maladministration or a systemic problem. Members who are subject to an Abacus matter are entitled to apply for the IAPro holdings in relation to that matter. Refer to right to information for further explanation. This page -- https://www.police.tas.gov.au/about-us/abacus/8-members-rights-obligations/ -- was last published on March 1, 2018 by the Department of Police, Fire and Emergency Management.